The tire entrance and centering station with a driven conveyor transfers the tire from any conveyor to the entrance station and to the testing station. A tire lubrication system is located at this centering station. This unit, with reservoir, automatically lubricates the upper and lower tire bead area. The application quality of the lubrication at the tire bead is critical to the repeatability performance of the Balancer System. Excess lubrication inside the tires during the balance cycle will affect performance repeatability. Insufficient lubrication will cause incomplete seating of the tire beads also effecting repeatability performance. This system is not designed for use with alcohol based lubricants. The luber system is design for use with Micro-Poise AkroLUBE II™ environmental tire/rim lubricant. Contact Micro-Poise sales representative for additional ordering details. A Bar Code Reader can be installed in the Tire Entrance Station and integrated as an option based on customer requirements. 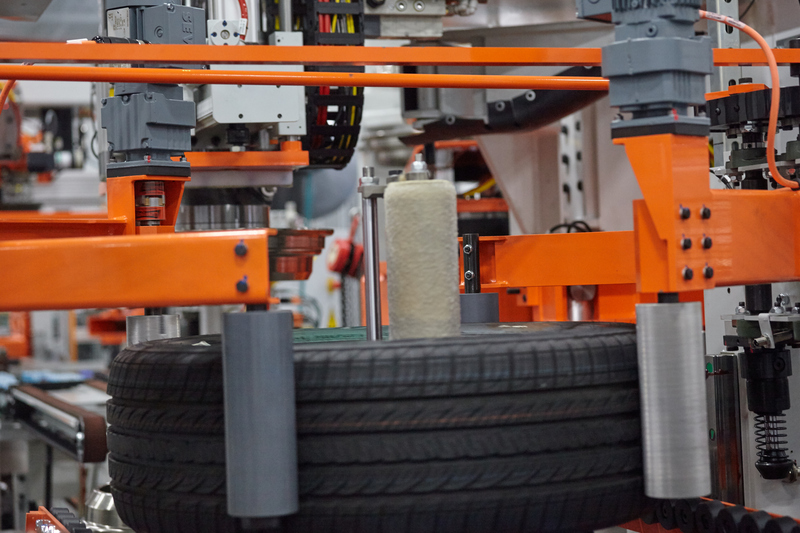 Click Here for more details about our Tire Identification Systems.